but I was told, the minimum he will accept per month is N200,000. Maximum salary I ever offered anyone is a lil lower than the minimum he wants, so NO DEAL! 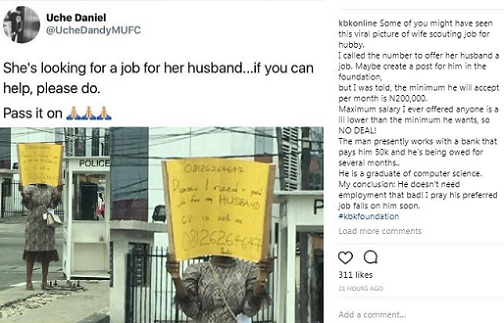 The man presently works with a bank that pays him 50k and he's being owed for several months.. He is a graduate of computer science. My conclusion: He doesn't need employment that bad! I pray his preferred job falls on him soon. » Protest Photos: Worker Carries Placard Changing APC To “All Promises Cancelled"